Hi Sarah! As soon as the single needles come in stock, I'm planning to order those, a 1.5 dermastamp, and a suction device to treat a few rolling scars and 3 boxcar scars. My cystic acne is mostly under control, but I'm still nervous about making sure to choose aftercare products that could break me out. Would keeping manuka honey on the area after needling work well? I mask with it regularly, and my skin responds well to it. I work at home, so having honey on my face all day is not a big deal. I also make vitamin C serum with the powder and water and plan to use that. I've used several retinol products over the course of my 20-year acne battle and have never responded very well to them (even though it's supposed to be so great for acne, and probably is for most people) so I would like to leave those out if possible. Also, it's my understanding that the suction device is for rolling scars but not boxcars. Is that right? "Officially" only the rolling type of acne scars are tethered to the underlying structures but I also recommend suctioning for stubborn boxcar scars that has not improved after about one year of microneedling. It is worth trying. 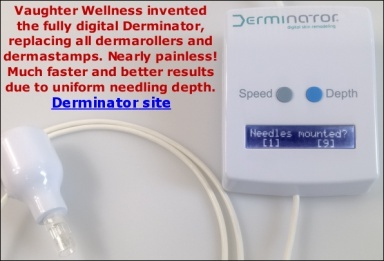 You can already order a dermastamp and the suction pump now because our shipping fees are based on weight so it will not cost you significantly more if you order the needles later. You do not have to use retinoid products. Thanks so much for your reply. So so there is a product you recommend for immediately after stamping that would be least likely to cause breakouts in the acne prone? Infadolan sounds risky in that regard. I tend not to advise a specific dermarolling aftercare product for acne-prone individuals because what causes breakouts in one, does not cause breakouts in the other and vice versa so I prefer that acne-prone people use products they know from their own experience.